We’ve made accepting payments from our clients faster, secure and really easy! We’re happy to bring you PayU Money – one of India’s most popular payment gateways as a fully integrated module in our my.innovativehostingcorp.com panel. Year End Sales from Innovative Hosting – Hurry, Ends December 30! Starting from December 18 we’ll be offering 20% off on your first year billing with any of our Shared and Reseller Hosting packages. If you were thinking about joining thousands of other businesses who host with Innovative Hosting, now is the time to join. Hurry, the Year End Sales campaign ends December 30, This offers apply to new customers only. By ordering a Shared Hosting or Reseller Hosting package on an annual billing cycle, you could save over 20% off your first year! These offers are strictly limited, so get in before the sale runs out! We are excited to launch our new affiliates program, Our Affiliate Program is easy to set up (no technical skills necessary) and free to join. You don’t have to be a long-standing Innovative Hosting Corporation customer to join as affiliate. We provide links and banners necessary to promote Our products and services. All you need to do is display them on your website or share them via word of mouth, social networks, and email. Click here to join the the Affiliates Program and benefit from being part of the community. Your business has outgrown its shared web hosting or Reseller hosting plan, but you’re not quite ready for the leap to a dedicated server. What to do? Linux VPS (Virtual Private Server) hosting is the answer. Linux VPS hosting has become very Popular, as it’s an ideal middle ground between shared hosting and the complexity of a dedicated server. Virtual Private Server (VPS) hosting is a level above Reseller hosting. As the name implies, it mimics the control available with a dedicated server, but at a lower price. The web host configures a server into several VPS accounts. Each VPS account has a share of the server’s resources allocated to it as a minimum performance standard, plus the use of additional processing resources when available. A VPS account gives you virtual root access and the ability to configure your virtual server as though you controlled an entire physical server. You have all the power of a LAMP (Linux, Apache, MySQL, PHP) server. Typically a VPS account comes with a control panel for management. At Innovative Web Hosting Solution, cPanel’s WHM is one of the available choices. The VPS control panel allows you not only to create shared hosting accounts, as with a Reseller account, but also to create and sell Reseller accounts. Guaranteed server resources allocated to your VPS account. Unlike shared and Reseller hosting, your account wouldn’t normally be affected by other users on the server. Support from the web host who creates the VPS. Innovative Web Hosting Solution, for example, offers comprehensive support with its VPS. This helps you concentrate on your own priorities, while allowing you to learn at an assisted level before moving to a dedicated server. Personal nameservers, which in my opinion are one of the great advantages of VPS or reseller hosting. Instead of using nameservers provided by your host, with their name in the domain name, you create nameservers tied to your reseller domain or main domain. If your main reseller domain is “xyz.com”, you may create ns1.xyz.com and ns2.xyz.com. You can configure all your “client” accounts to use ns1. and ns2.xyz.com as their nameservers. This is better for branding your business, and makes the task of moving to a new server or host far simpler. There is Large Number of Brute Force Attack on WordPress Sites, At this moment, we highly recommend you log into any WordPress installation you have and change the password with upper and lowercase letters, at least eight characters long, and including “special” characters like (^%$#&@*). Make sure you are running the latest version of WordPress and all the plugins and themes. Secure your WordPress Login page. 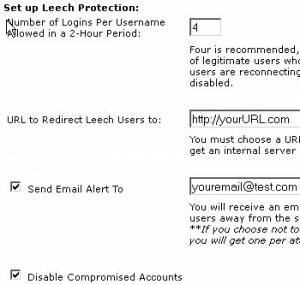 To do this you can simply log into your cPanel/Plesk Panel and use the Password Protect Directory option and secure the wp-admin folder of your WordPress installation using a secure password generated via a Random Password Generator so that your password is not easily uncovered under brute-force attack. We’ll continue to monitor the details of the attack and publish details about what we learn. Why are digital certificates so important? A digital certificate helps you clarify your identity to your visitors, particularly if you collect sensitive data such as credit card and confidential information through online transactions. The information transferred through your website is encrypted when a digital certificate is applied. This ensures confidentiality for the end user. Protect yourself and your customers from possible threats of online fraud and information hijacking also known as phishing. With Innovative Hosting Corporation you have access to a comprehensive range of digital certificates from world leading providers such as Thawte and Positive SSL, all backed with INDIAN based telephone support and fully assisted order placement.